That's pretty sad, considering there's twelve of them. Or maybe she means just these four. 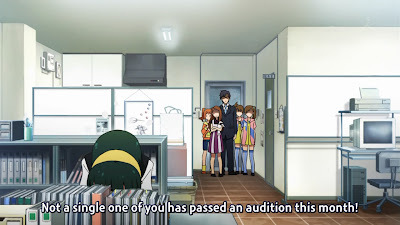 The episode began with Kotori (the office lady) lamenting that the girls had failed to secure any jobs for the month, being completely annihilated in the auditions that the mini-group were returning from. Producer saw the promo shots and immediately saw a problem with them (I thought so too, considering Ami and Mami were in monkey costumes), and wanted to take news ones. 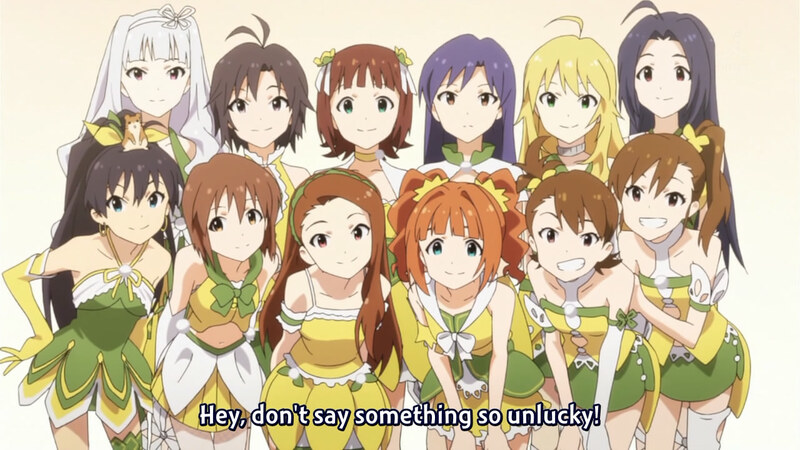 At that moment, Ritsuko walked in with the new matching costumes for all the girls (which had dried up the company's funds), causing Kotori and Producer to have to beg her to spend the money for the promo shots. After being told that it was an investment for the future (really, she couldn't figure that out herself? ), she and her yen-filled eyes were onboard. Indeed, it would be serious if it was actually physically possible for your heart to jump out. 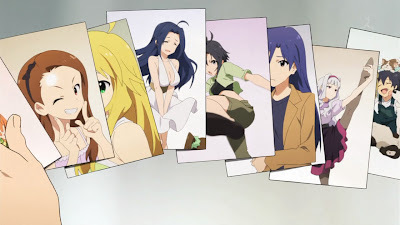 It's strange to have such a full cast when only a handful were focused on in this episode, but it also gives the feel that all the girls are doing something behind the scenes. 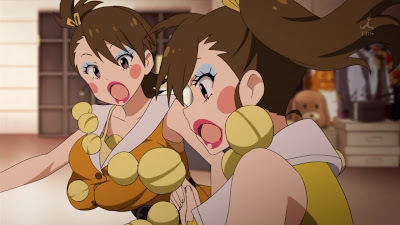 Makoto got a phone call from Producer about the costumes while at the dance studio with Miki, Yukiho and Hibiki stretching in the background. 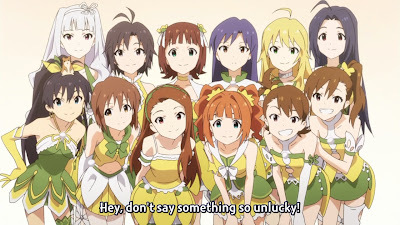 Chihaya received a text about the new promo shots while at some kind of audition with Haruka and Takane. 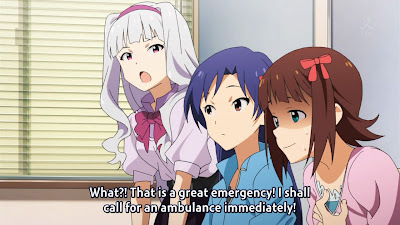 Speaking of which, Takane's intense reaction to Haruka's usage of words kind of showed that she was a super-sheltered girl - that, or she's an alien. While I don't think this is that kind of anime, Soredemo Machi wa Mawatteiru suddenly turned a little supernatural out of nowhere, so let's not fully discount that. In the meanwhile, I'll operate under the theory that Takane is super-sheltered, though. I genuinely did not understand what the pyramid had to do with it. 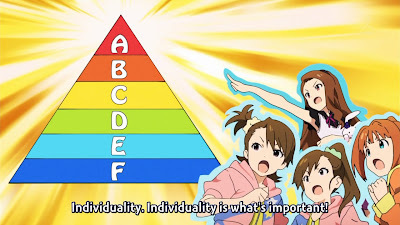 After a momentary glimpse of what is sure to be an important character (Haruka bumped into a gruff boy as she was exiting the room), the scene shifted to Miki, Yukiho and Makoto looking at the new costumes, and then quickly again to the mini-group talking about what to wear. Iori did have the right idea of being original instead of copying other idols; what idols wear and do is supposed to influence the audience, not particularly other idols. The pep talk only revealed that the girls really had no idea what they were doing, wanting to dress up as a bear and steak, but that was to be addressed in the rest of the episode. Yeah, make-up tends to sparkle like that. They are definitely appealing to a certain crowd. Quite obviously, the mini-group's ill-advised foray into the world of adulthood didn't go well. Iori, in her typical over-confident way, was about to confront Producer on what, if anything, was wrong with their outfits, but she pretty much answered her own question by tripping on her skirt. The ensuing madness caused Ami and Mami to "unravel" as well, while Yayoi stumbled and fell. An off-screen "clean-up" scene later (which only consisted of taking out the padding and removing the make-up), Producer attempted to explain to the girls the important of individuality and what it actually meant, but failed because he himself didn't know to say it. Miki showed up in her usual transcendent manner and explained that the outfits just didn't suit them. Wasn't she supposed to change into the lighter periwinkle-coloured dress? The rest of the scenes until it was the mini-group's turn basically showed the various girls having their photos taken while being themselves. Now, the initial problem with the promo shots was that the owner had told them to capitalize on their special traits, and that's what led to disaster. However, given that they didn't show any thought process or development for the other girls, I really fail to see why the second batch of promo shots would suddenly be better for everyone and not just the mini-group's. Miki also seemed to be super-pro, which makes me wonder if her first batch was not fine - and, if it was, then how come they redid hers too, given that 765 Productions is in need of money? This kind of confusion arises when off-screen things happen with characters. I guess I'll just have to imagine that lots of growth and development took place for the other girls, too. I notice Miki is really hidden. Was hers okay, or what? After watching the girls taking their pictures (which was pretty much the only one-on-one face-time they got with the screen), Ami and Mami came up with their own concept of what they wanted to portray and rushed off to change. I felt a little annoyed that Yayoi didn't change clothes for the new batch of pictures; they've been really capitalizing on her poorness in these two episodes. Azusa's explanation of it being fun taking pictures in favourite clothes was also pretty lacklustre; she was obviously given the dress to wear for her shot, so could Yayoi also not be given something? That bothered me a lot. Anyway, Iori ended up taking the picture as "naturally pretty Iori-chan", with her stuffed rabbit, Charles. I'm sure that's always a worry with padding. 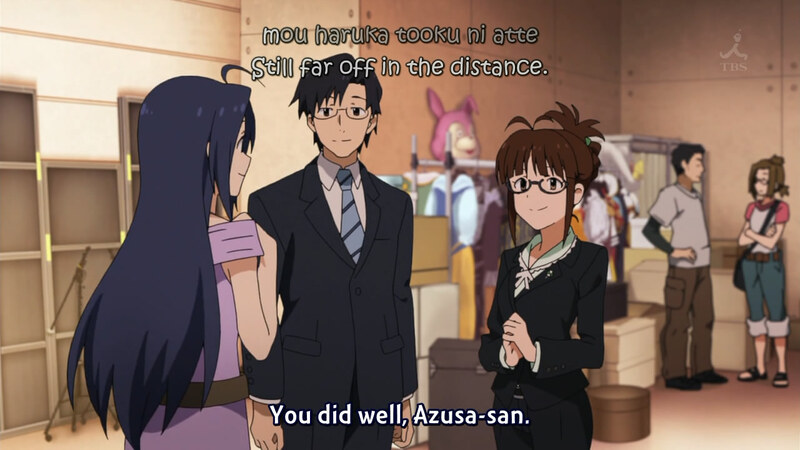 I must note that while ep01 didn't have an OP, it did have an ED. 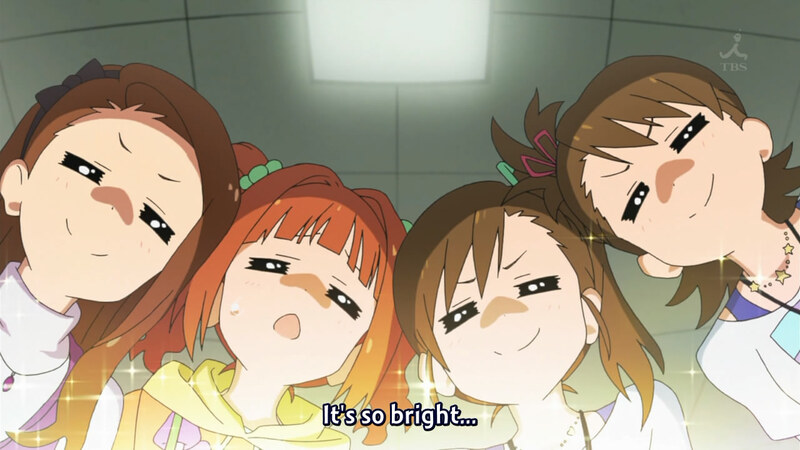 Usually, the first episode's ED is actually the series' OP. 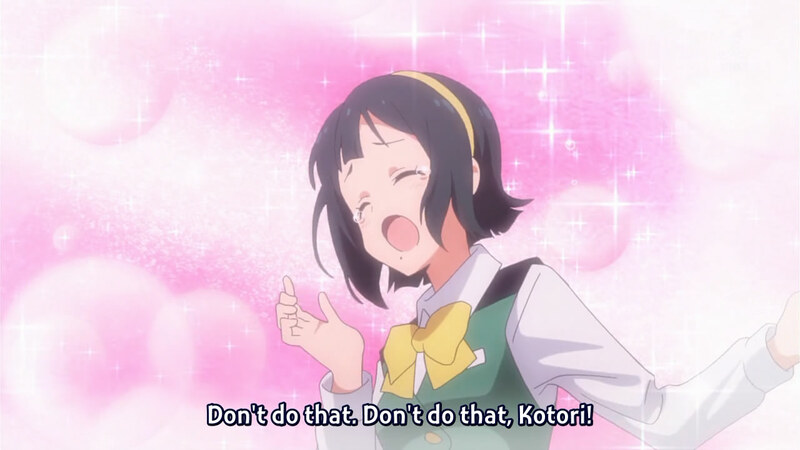 (With Uta no Prince-sama, for example, the sneakily swapped the OP and ED for the first episode.) However, the ED from ep01 didn't show up anywhere in ep02; instead, there was a brand new OP and a new ED focusing on Iori. I wonder if maybe the ED is supposed to be specialized for each episode, considering that it may follow an "idol of the week" formula. The original seiyuu from the games ported themselves over to the anime, so there's lots of songs to sing and use. Don't do what? Make the idols fall in love? Good luck. I'm liking this anime so far, especially if it'll focus on a different girl every week instead of having Haruka be the main character. I'm a little disappointed that only the happy-go-lucky side of the business is currently shown. I guess it's a little too early to deal with jealousy amongst peers, overbearing fans, critical press, lack of sales, etc, so I'll stay hopeful even though I genuinely get the feeling that things like that won't be covered seriously. 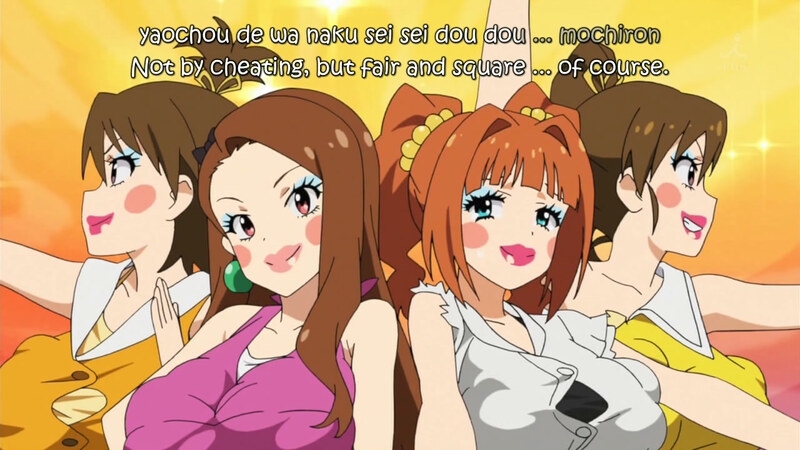 At any rate, this anime is turning out to be mostly what I wanted: a focus on various idols.